This entry was posted in Randy's blog entries on March 27, 2019 by randy. Psychological safety is broadly defined as a climate in which people are comfortable expressing and being themselves. (Amy Edmondson). What is the point? — We need to hear every voice – every insight, every opinion – of everyone, at work. This requires an environment of psychological safety. Let’s assume that a company hires good people, puts them into teams, and expects them to deliver on important goals for the company. If that is true, then that company needs every member of every team to make their full and needed contribution to the team. In other words, their work is valuable, and should be embraced and encouraged (and recognized and rewarded). How foolish is it to hire someone, and say: “now, don’t do your work; don’t give your best effort.”? Foolish indeed! 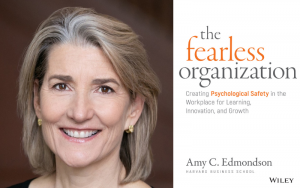 In her book The Fearless Organization: Creating Psychological Safety in the Workplace for Learning, Innovation, and Growth, Amy C. Edmondson is basically saying this: whenever any person is silent in the midst of conversations among team members, then that team is rejecting the talents and capabilities of that team member. Every person has to speak up. Every person!, really, has to speak up. And any behaviors by leaders, or other team members that squelch such speaking up is detrimental to the success of the team. (I presented my synopsis of this book at the March First Friday Book Synopsis in Dallas). Ms. Edmondson describes this optimum work place – one where the people are not silent, but one where the folks can and do speak up – a work place with Psychological Safety. I think I first read this term in the book Smarter Faster Better by Charles Duhigg. This book focuses more fully on this practice. And, yes, it is a practice! Team members have to practice creating a place of psychological safety. You can already guess the problem (maybe partly because people are so competitive): some people use belittling and ridicule as tools to keep people silent. I always give my reasons why a book is worth our time. Here are my three reasons for this book. Notice especially #s 2 & 3. Why is this book worth our time? #1 – The way we work has changed. This book will help us understand this change. #2 – The failure to speak up, by any and every member of the team, leads to the failure of the team. This book will help us understand this truth. #3 – Leaders silence their team members, Team members silence themselves. This book will call us all to quit silencing others, and ourselves. Each voice needs to be heard; must be heard! This dynamic collaboration is called teaming. Teaming is the art of communicating and coordinating with people across boundaries of all kinds – expertise, status, and distance, to name the most important. But in a psychologically safe workplace, people are not hindered by interpersonal fear. They feel willing and able to take the inherent interpersonal risks of candor. They fear holding back their full participation more than they fear sharing a potentially sensitive, threatening, or wrong idea. The fearless organization is one in which interpersonal fear is minimized so that team and organizational performance can be maximized in a knowledge intensive world. It is not one devoid of anxiety about the future. …they feel comfortable sharing concerns and mistakes without fear of embarrassment or retribution. Don’t want to look ignorant? Don’t ask questions. Don’t want to look incompetent? Don’t admit to mistakes or weaknesses. Don’t want to be called disruptive? Don’t make suggestions. The fear of speaking up can lead to accidents that were in fact avoidable. Remaining silent due to fear of interpersonal risk can make the difference between life and death. …Airplanes have crashed, financial institutions have fallen, and hospital patients have died unnecessarily because individuals were, for reasons having to do with the climate in which they worked, afraid to speak up. (Note from R.M. – I wonder if anyone on any team at Boeing wanted to speak up about dangers with the new airplane, and did not feel that it was “safe,” to speak up?). A key insight from this work was that psychological safety is not a personality difference but rather a feature of the workplace that leaders can and must help create. Is this a place where new ideas are welcomed and built upon? Or picked apart and ridiculed? Will your colleagues embarrass or punish you for offering a different point of view? Will they think less of you for admitting you don’t understand something? In other words, the more we talk to each other, the more comfortable we become doing so. Cheating and covering up are natural by-products of a top-down culture that does not accept “no” or “it can’t be done” for an answer. In short, for voice to be effective requires a culture of listening. A culture of silence is a dangerous culture. Frankly, adopting a humble mindset when faced with the complex, dynamic, uncertain world in which we all work today is simply realism. Humility is the simple recognition that you don’t have all the answers, and you certainly don’t have a crystal ball. Research shows that when leaders express humility, teams engage in more learning behavior. Perhaps the best way to experience psychological safety is to act as if you have it already. See what happens! Here is the issue: can the people in your workplace speak their mind? Do they? — the more “silence,” the more bad calls you will make. — do you trust the insight of the people doing the job being discussed – e.g., In Dalio’s terms, it’s the forklift operators themselves who have earned the “right to have an opinion” on whether or not there’s enough clearance for their trucks to pass through an area. 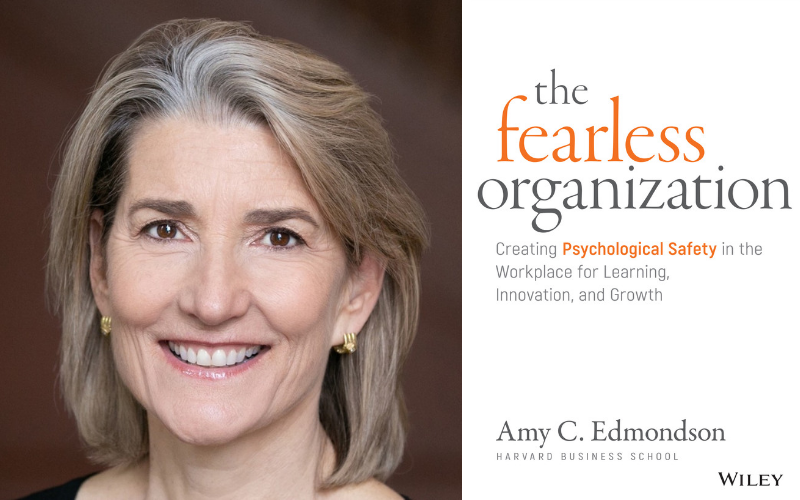 Building the fearless organization – and the role of psychological safety — the central argument in this book – that no twenty-first century organization can afford to have a culture of fear. #1 – Do not practice keeping silent (when you should speak up). Do not let others keep silent. Pull their words, their thoughts, out of them! #2 – The motivation is good will – “I want to help.” The method is speaking up and speaking out. #4 – The practices of psychological safety have to be regular practices; i.e., practiced all the time. This has to become a “way of life” at work. #5 – Every silent voice hurts the team, and maybe others, and slows down or stops the growth and progress. Speaking out, in an environment of psychological safety, is a modern-day survival necessity. We’ve presented synopses of over 500 books at the First Friday Book Synopsis in Dallas. The books “pile up” in our thinking and the arguments reinforce one another. Read any and every book you can find on teams, and I think you would come to this conclusion: get the right people, set them free to work together well, and make sure none of them keep silent. They’ve got to speak their minds! The more they do, the more the team moves forward. This book explains the value of this practice especially well. (My synopsis, with the audio recording of my presentation, along with the multi-page, comprehensive synopsis handout, will be available for purchase soon from this web site. Click here for our newest additions).